ahass0593 Great! And loved the product! 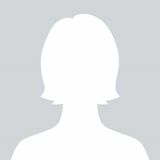 ldianne Great seller to deal with! Item delivered as described she even give me a cute coach purse freebies 😍. Excellent pre-loved condition! 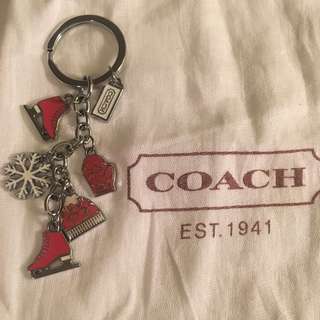 Authentic Coach keychain in winter-theme with snowflake, skates, hat & mittens. Comes with dust bag. Excellent pre-loved condition! 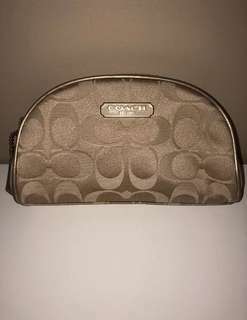 Authentic Coach ID holder with zippered coin section, keyring and wristlet strap. In plaid print with glitter C’s. Size is 4.5 inches x 3.25 inches. Comes with dust bag. Excellent pre-loved condition! 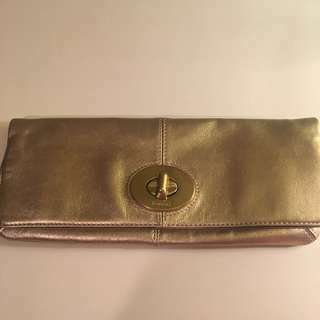 💜 Authentic Coach “Madeline” gold leather foldover clutch with turnlock closure. Small zippered pocket.  Signature C lining. MSRP $248 Size is 10.5 inches x 4.25 inches when folded. Very good used condition! 💜 Some slight wear on leopard print. 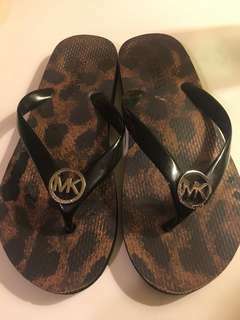 Authentic Michael Kors flip flop sandals in leopard print with silver MK logo plates. Size 6.5. Very good pre-loved condition! 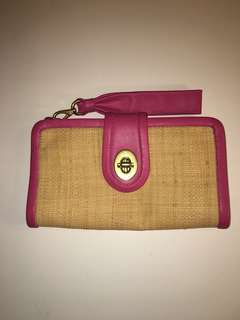 💜 Authentic Coach Parker clutch / wristlet in straw with pink leather trim and brass turnlock. Zippered closure. Removable wrist strap. Size is 8.75 inches x 5 inches. Excellent pre-loved condition! 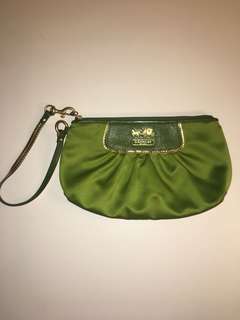 💎 Authentic Coach for Estee Lauder limited edition gold signature makeup bag. Coach hangtag attached. Zippered closure. Size is 7 inches x 4 inches. $25 or best offer. Shipping available! Excellent pre-loved condition! 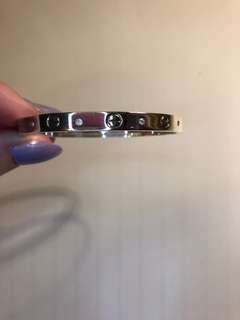 💎 Cartier-inspired “love” bracelet. Stamped 18kgp (white gold plated). 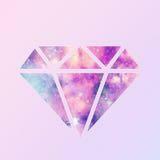 Cubic zirconias. Fits up to 6.5 inch wrist. Shipping & local pickup available. Excellent pre-loved condition! 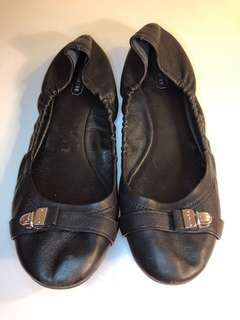 💎 Authentic Coach “delphine” black leather ballet flats in size 8M. Shipping & local pickup available. Excellent pre-loved condition! 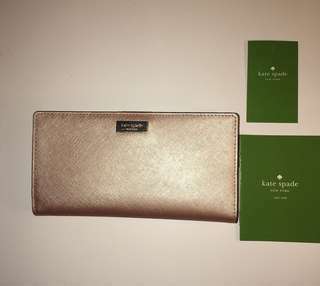 Authentic Kate Spade Laurel Way “Stacy” wallet in metallic rose gold. Comes with care card and price tag. Excellent pre-loved condition! 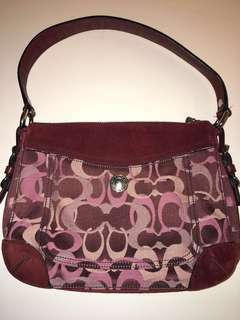 💎 Authentic Coach “Chelsea” bag in burgundy signature optic print with suede accents. Zippered closure. #7035 Size is 9.5 inches x 7.5 inches. Shipping available! Excellent pre-loved condition! 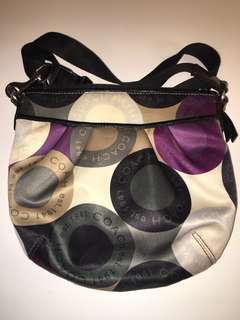 💎 Authentic Coach “Alexandra” snaphead scarf print crossbody bag. Zippered closure. Adjustable crossbody strap up to 46 inches long. Size is 9 inches x 8 inches. $30 or best offer. Shipping available!